The Asus A52F-XN1 15.6" Laptop PC is going to become your everyday computing companion. This laptop features a slim profile which makes it very portable and allows you to carry it wherever you go. It also features a smudge-proof palm rest that resists fingerprints, and helps the ASUS A52F retain its brilliant appearance all day. 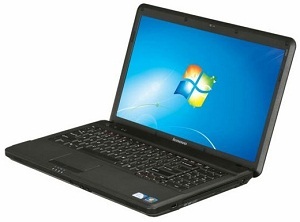 Get to work with a Lenovo G550 Laptop! This productivity oriented laptop computer is equipped with an Intel Celeron 900 processor, which churns through office tasks at an efficient 2.2GHz. 2GB of modern, DDR3 memory provide a quick and stable work space your your processor and allow your computer to run without bumps or hiccups. Work and play both with look great on the 15.6", high definition display which is equipped with a glossy coating to make your colors more vibrant. You'll appreciate the fast and familiar Windows 7 operations system as well, which promises a safe and simple computing experience. If you're on the market for cheap to mid-ranged laptop for business or pleasure, the Lenovo G550 is a great choice. 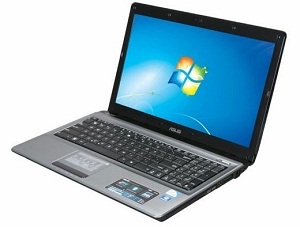 This ASUS Eee PC 1018P Netbook offers big performance in a compact design! The 1018PB-BK801 runs on Microsoft Windows 7 Starter and the roomy 250 GB hard drive provides ample storage for documents and media files. The 10.1-inch LED Backlit widescreen LCD makes it easy to see your applications! Connect to the Internet using the 10/100 Fast Ethernet LAN port or get access to a wireless network at home, at the office or any Wi-Fi hot spots via 802.11b/g/n wireless LAN. 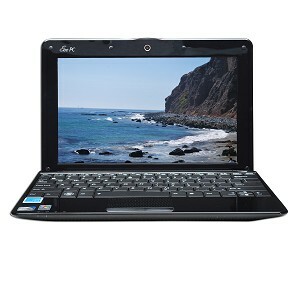 Load pictures, videos and music onto the netbook with the built-in memory card reader. It supports SD, MMC and SDHC flash memory cards! Chat face to face over the Internet with friends and family with the built-in webcam. VGA, USB 2.0 and audio ports are provided so you can connect an external optical drive, digital camera, printer and other devices. Easy to use, this portable ASUS Eee PC 1018P Netbook is ready for mobile computing! Versatility, power and performance come standard in this ultra-portable Dell Inspiron duo convertible tablet! 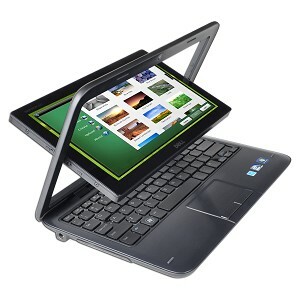 This 10.1-inch widescreen High-Definition touchscreen can be viewed in a vertical position as a netbook, or for working in tight areas, a simple push on the top of the LCD rotates the screen to a locking external tablet display. Need to go back and forth? No problem! Switching between tablet and netbook is quick and easy, and does not require you to restart the system or cancel any applications. Backed by a dual-core Intel N550 1.5 GHz processor and 2 GB of DDR3 memory, this Dell Inspiron duo can power through even the most demanding of multitask workloads. The massive 320 GB hard drive provides ample storage space for all your applications, games, videos, music, data files and more! Compute in an extremely user-friendly environment with Microsoft Windows 7 Home Premium pre-installed. While there is no optical drive installed, this handy netbook features two hidden USB 2.0 ports that can be used for adding on a wide array of peripherals, or covered up when not in use. Video conference with family, friends and coworkers via the built-in 1.3 megapixel webcam and microphone. Connect to local networks and the Internet at home or on the road via the 802.11b/g/n Wireless LAN. With High Definition audio and graphics, this Dell Inspiron duo delivers an exceptional multimedia experience, there's even a headphone jack for private listening when in public places. At barely an inch thick, and nearly 4 hours of battery life on a full charge, this Dell Inspiron duo netbook/convertible tablet is the ideal computing solution for anyone on the go! The MID M80003W touchscreen Android tablet features a vivid 8-inch TFT display and Google Android OS 2.2 pre-loaded, giving you a highly interactive and customizable couch companion that is also cost-effective. Breeze through emails and browse the web with the integrated IEEE 802.11 b/g wireless LAN connectivity or 3G wireless connectivity. The M80003W features a VIA 8650 800 MHz processor with 256 MB RAM and 2 GB of built-in storage, but you're free to expand that storage capability with the built-in microSD/SDHC card slot. Slide a card in and enjoy photo slideshows, music playback, and even video playback! Snap photos with its built-in front-facing 3 MP camera! Browse the Android App Market and find thousands of apps that add additional functionality to this tablet! 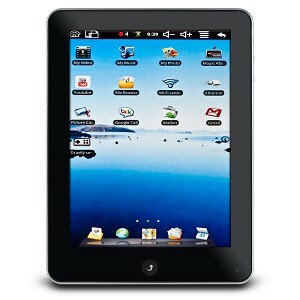 This tablet includes an AC power adapter and the built-in lithium-ion battery gives you hours of entertainment. The MID M80003W 8-inch Touchscreen Android Tablet provides a cost-effective portable multimedia companion that's ready to complement your digital lifestyle!